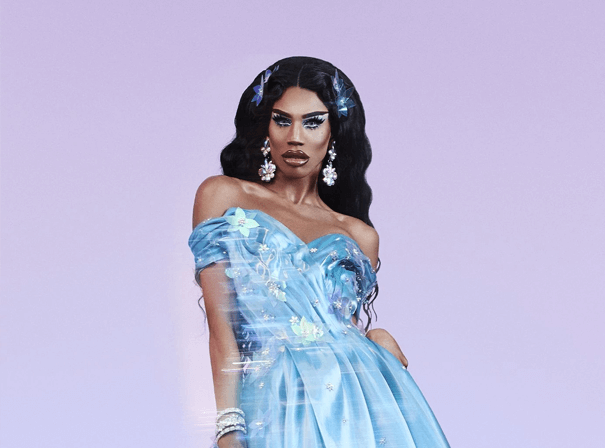 Davis Heppenstall, better known under the stage name Naomi Smalls, is one of America’s most recognisable drag queens and a former contestant on the globally popular television phenomenon RuPaul’s Drag Race. Her drag name was inspired by a combination of Naomi Campbell and Biggie Smalls, bringing the effortless grace and fierceness of the model together with the boldness and attitude of the late hip-hop artist. With over 1.3m followers on Instagram and a swiftly growing YouTube presence, this fiercely individual drag star is one of the most influential and inspirational queens on the global scene. Smalls rose to public attention after being selected as one of twelve contestants to appear in RuPaul’s eighth season in 2016. Making an indelible impression on judges and audiences alike, she reached the final three, only to lose to Bob the Drag Queen and tie with Kim Chi for second place. She’s since established herself as a central presence in American media, co-hosting the WoWPresents web-series M.U.G. alongside fellow runner-up Kim Chi while taking part in profiles and features for global publications such as The Fader, Billboard, Cosmopolitan, Elle and The New York Times. Most recently, Smalls has returned to compete in RuPaul’s Drag Race All Stars, once again reaching the final round of the competition. She’s also made a dramatic entrance into the music world, issuing her debut single in late 2018: already racking up over a million views, ‘Pose’ has revealed an astonishing musical talent with the world at her feet.